Dehumidification with a DST dehumidifier provides the advantages of excellent corrosion protection, longer durability and the saving of resources. Corrosion damage can lead to large costs in bridge construction worldwide. The bridge construction is assured against corrosion through development of an environment that keeps a maximum of 50%RH around the steel construction. 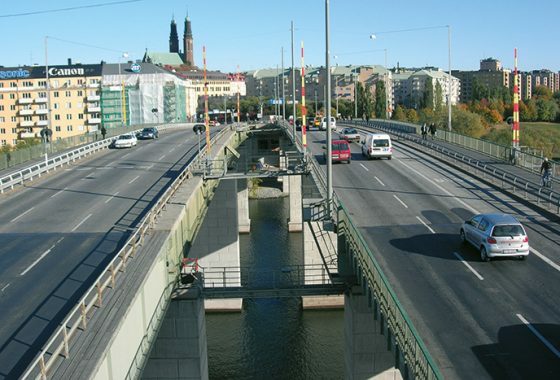 Corrosion of mild steel components and high tensile support wires can soon compromise structural integrity resulting in safety issues, costly traffic restrictions and ultimately bridge closure. The girders, on which the tracks lay, can be protected against corrosion by the circulation of dry air through the truss, whereas the corrosion protection paint is expensive and demands maintenance. Painting the bridge increases the weight. Even affixed constructions can be dehumidified instead of using corrosion protection paint. A dehumidifier demands minimal maintenance and saves a lot of time compared to personnel applying corrosion protection paint. Corrosion protection is also necessary in spots very difficult to reach and dry air is often the preferred method.